The E8 European path. In this engaging book he begins the challenge on Dursey Island, County Cork in the Republic of Ireland and ends this first stage in Dublin. Utilising an elderly campervan and a pushbike Mike shuttles along, experiencing injury, breakdowns and frequent loss of bearings. The walk will eventually traverse 12 countries and end in Istanbul, Turkey. If he makes it he will be 84 years old. In 2018 he arrived in Obernburg, Germany, having now covered around 1,170 miles of the trail. Along the way Mike delves into the depths of Irish history. In Kenmare he discovers the ruined house that was once the refuge of a 17th century Protestant colony; in Killarney he tries to uncover the motives of a solicitor turned forger who was transported to Australia, whilst in a Millstreet pub the atmosphere is alive with the spirit of the Volunteers that would become the IRA. The events of the War of Independence and Civil War are traced as the path winds its way through Fermoy and Clogheen to the village of Newcastle. In Carrick-On-Suir the roots of Irish folk music link to Bob Dylan, while near Clonegal and Tinahely Mike finds evidence of the potato famine and the subsequent mass exodus of Irish to the United States and Canada. This fascinating insight into the legendary and mystical land that is Ireland concludes amongst fairies, leprechauns, James Joyce and Guinness in Dublin. Born near Portsmouth, England in 1945, Mike Pinnock lived his childhood within the dockyard. 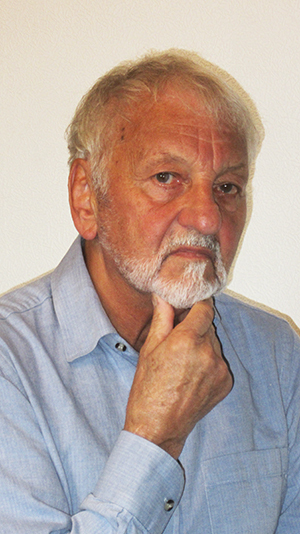 Until his retirement in 2005 he spent his working life in industry; for the final 32 years employed by Calor Gas Ltd, latterly as a Senior Engineer, where he worked in locations around the UK, Europe, Argentina, China, Pakistan and Taiwan. His first book A Bootneck’s Footsteps was published in 2008. Walk East Until I Die was published in 2018, and Mike is currently writing a sequel covering his walk across the UK and Netherlands. He lives with his partner Polly; they currently divide their time equally between Spain and the UK. Most of us enjoy a good walk. It’s a great way to keep fit, meet people, and generally shake off the cobwebs. Mike Pinnock, however, has taken the idea a stage further – and intends on taking it several stages more. In fact, in his book he writes that he plans to ‘Walk east until I die’. Mike is a retired mechanical engineer, although he still takes on the odd contract, both to keep his hand in and to help finance his travel plans. Those plans entail traversing twelve countries across Europe, ending up in Turkey, hopefully before his 85th birthday. Crazy? That’s certainly one word for it. Another is wonderful! As retirement loomed a few years ago, he decided he would like to travel the E8, a European long distance (you can say that again!) walking route that would take him from the west coast of Ireland to the Turkish capital of Istanbul. That, by the way, is around 4,700 km or 2,920 miles. 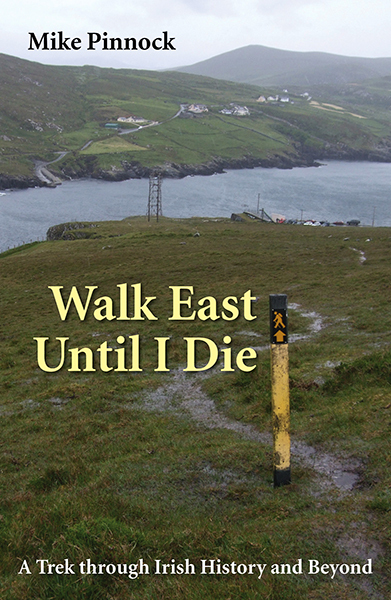 The good news is, he has not only finished the Irish stage of that epic journey, but he has also finished his book about it which has been published as Walk East Until I Die. Its subtitle is ‘A trek through Irish history and beyond’, and he doesn’t exaggerate. In seventeen chapters, the reader shares his interests, frustrations, musings, sense of tranquillity and blisters. He was a stripling of 67 when he began the adventure at Dursey Island, County Cork in June 2013. Over the following month he made his way to Clonmel. Other commitments demanded that this was all the time he could devote to the project that summer, but he resumed from Clonmel to Dublin the following year. So how did he do it? How did he walk all that way on a budget too limited to allow for restaurant meals and B&Bs every night? Mike is the proud possessor of a small camper van and a trusty bicycle, both pictured on the back cover. At the start of each day, he would drive to his destination point, secure his bike, then drive back to the starting point. Then walk. Each evening, on completion of that particular stretch, he would retrieve his bike and cycle back to the start to where his camper waited. Incidentally, the cycle back to the van often came after a seventeen mile or more hike. Mike is no green-tinted-spectacles-wearing Englishman. He’d done his homework and his knowledge of Irish history would leave many of us ashamed, and he has that ability to interweave the apparently trivial with the ‘serious’. He loves language and the way in which Irish people use English, with that quirky sense of humour that lies somewhere between gentle humour and scathing sarcasm. The ‘trek’ takes in stretches of the Beara Way, the Kerry Way, the Blackwater Way, East Munster Way, South Leinster Way, the Wicklow Way, and a few highways and byways besides. There are also detours and wrong turns. But can there really be a ‘wrong turn’ on a voyage of discovery? Mike Pinnock gets very philosophical about events which at times added miles to his intended trip, such as missed way markers or, worse, no markers at all. Pinnock has written that most elusive of books – a perceptive and, more importantly, thoroughly enjoyable travelogue. His accounts of ruined castles, Bob Dylan and the Clancy Brothers, the Famine and mass emigration stand side-by-side with stories from various village pumps along the route. Since completing the Irish section and writing this book, Mike has walked across England from Liverpool to Hull in twelve days along the Trans-Pennine Trail, caught a ferry to the Netherlands and walked across it in eight days, following the Grote Rivierenpad (Great river path) to Nijmegan. Last year he crossed the German border to arrive in Kleve; from there he walked south-east via Aachen and arrived, after twelve days, in Bonn, notching up 930 miles on the path. This Spring he returns to Bonn and intends to add another 230 miles to the tally to finish in Obernburg. But back to his Irish Odyssey. The only aspect that he regrets was his inability to acquire a taste for Guinness, but this has since been rectified. He also wonders if he completes his journey to Turkey will he have hiked his way into the Guinness Book of Records? Check his progress at www.walkeastuntilidie.com then click on ‘See the walk in more detail’ for photographs, maps and walking log.